Rank lists are in, 20 days until Match Day! That’s all I’m going to say about that — you can go ahead and read more about it if you like. 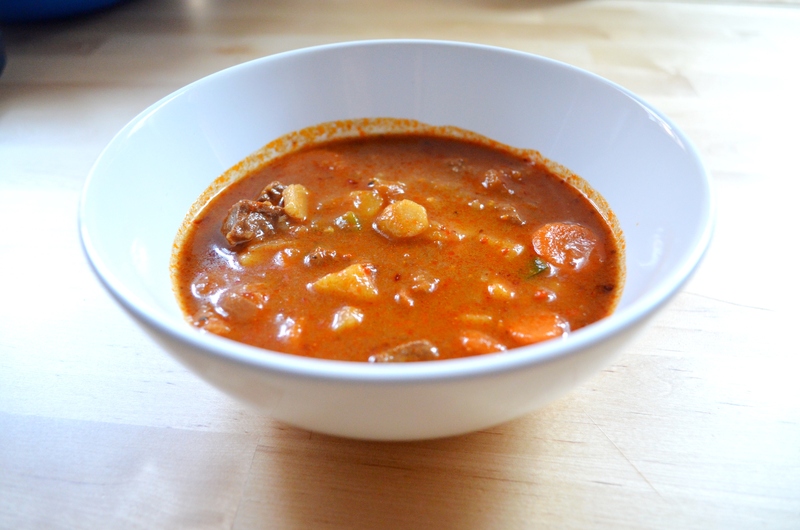 I want to share with you one of my oldest, trustiest recipes. 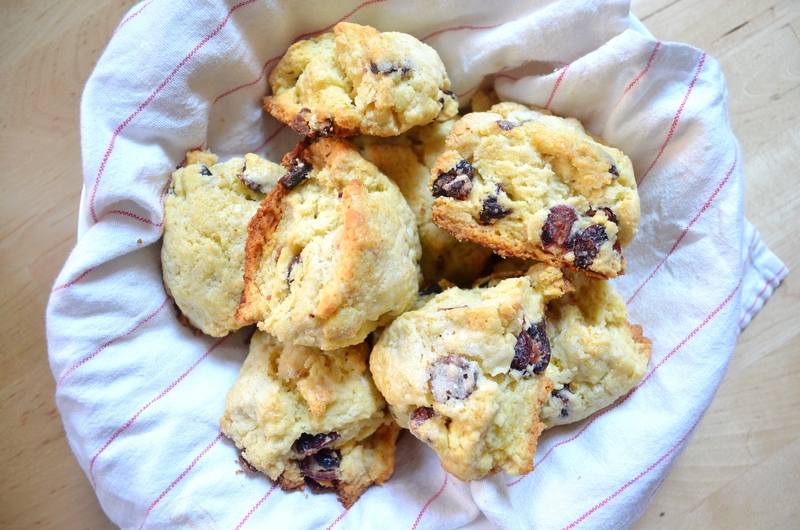 These scones redefine the way you think about scones. Most people hear the word and imagine a softball-sized chunk of dry, crumbly carbs that are hardly worth the extra coffee you need to drink to choke them down. No, these are totally different: they’re small, flaky, buttery, and so worth the 30 minutes it takes to make them. They are the perfect way to get a house full of people to appreciate you, and all you have to do is hit the snooze button 3 fewer times. These guys originally call for an egg wash to make them very pretty to photograph, but in my experience a batch does not last 25 minutes out of the oven, so who cares what they look like. Save your egg for something useful, like dropped in a bowel of ramen or baked into a cake or fried on a burger or one of the other 9274857 amazing things we as humans have figured out we can do with unfertilized chicken ova. In a large bowl, whisk together flour, 1/4 cup sugar, baking powder, and salt. Stir in your fruit of choice (or chocolate). Grab a pastry blender and cut the butter into the dry mixture, until the butter pieces are about the size of peas. In a separate, smaller bowl, whisk together egg yolks and 3/4 cup heavy cream. Pour into the flour mixture and toss with a fork to combine. Knead gently and briefly to bring the dough together in two equal portions. Shape each into 4-5″ rounds and slice into 6 triangles for a total of 12 scones. Arrange on the baking sheet, with equal spacing between each scone. In the bowl that held the egg yolk mixture, add a couple more tablespoons of cream and stir to pick up any extra yolk. Brush this mixture over each scone, then sprinkle some sugar over the tops. 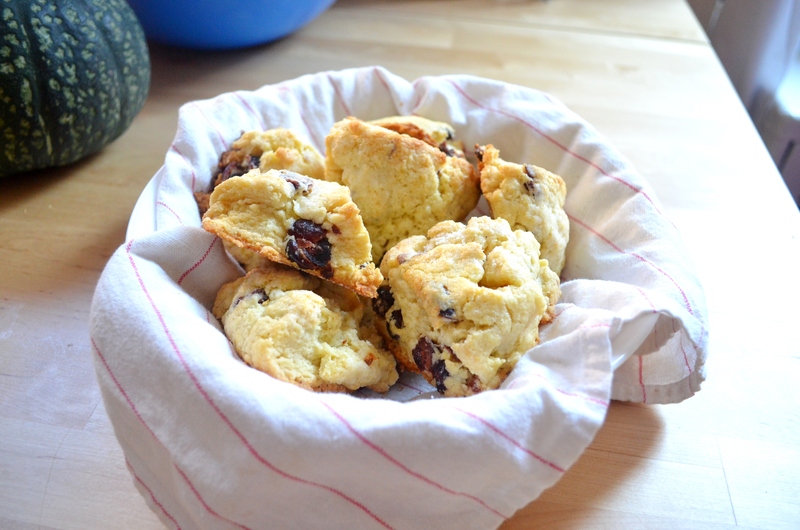 Bake in the preheated oven for 15-20 minutes, until the tops are golden or the scones no longer look/feel raw. Let cool for a couple minutes before enjoying warm. After so many failed attempts at making yeast-risen bread in college, I was convinced I just didn’t have that magic touch. Home-baked bread was a thing of legends, and people who could throw together beautifully crusty, golden loaves were all-powerful sorcerers as far as I was concerned. I labeled myself as “yeast-challenged” and shrugged off all urgings to try again for a long time. I attempted babka a little while ago, the pain of multiple failures now distant enough to forget. The thing never rose, of course, and ended up tasting a lot like someone painted a cardboard box with chocolate and sugar. Crazy-frustrated, I turned to the internet and spent an entire afternoon reading about yeast. Tuuuurns out a little understanding can go a long way — a week later I kvelling all over my gorgeous new challah-baby. 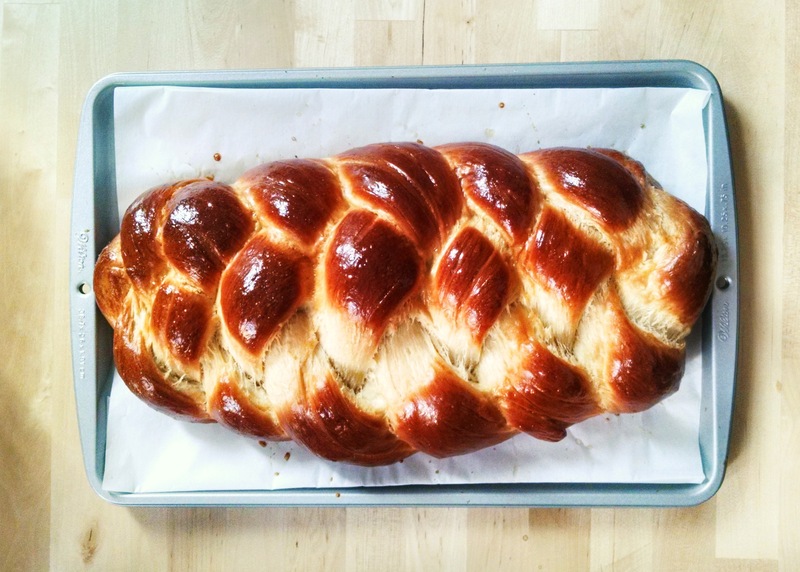 Everyone likes their challah a little different… which I guess is a much blander way of saying that everyone likes their challah as close to their grandmother’s version as possible. My family’s chewy, sweet, dunk-it-in-tomato-soup challah comes out to play every year at Rosh Hashanah, but it’s a circular behemoth that isn’t too practical in my tiny kitchen. I’ve scaled it down and altered it a bit so it works better as a stand-alone bread, but you’re doing it wrong if you don’t use at least some of it for french toast and grilled cheese. Proof yeast by combining with sugar and warm water in a small bowl. Let rest for 10 minutes, until foamy. In a large bowl, measure out 1 cup flour. Pour in proofed yeast mixture and stir until smooth, then cover with a towel and let rest in a warm spot for 45 minutes. Add to the sponge the oil, honey, 2 eggs, salt, and cinnamon, and mix well. Stir in 3 cups flour until the dough is a sticky mass. Turn onto a floured surface and knead well for about 10 minutes, adding more flour as you go to prevent sticking. The dough should be smooth. Take a clean large bowl (maybe have your kitchen elf boyfriend wash the bowl you used before?) and drop a bit of canola oil to lightly grease it, then add the dough ball and turn over to coat. Cover with a towel and let rise in a warm place for 1 hour. Punch down the dough, add a few drops of oil to coat, and let rise again for another hour. Divide the dough into 4 equal segments, giving them a good squeeze to get the big air bubbles out. Roll each of the segments into a tapered rope, roughly 16″ in length. Braid however you want, but I like this method the best. Preheat your oven to 350°F, stack two baking sheets on top of each other (this prevents the bottom from burning), and line with parchment. Place the braid on the parchment and whisk together the remaining egg and water. 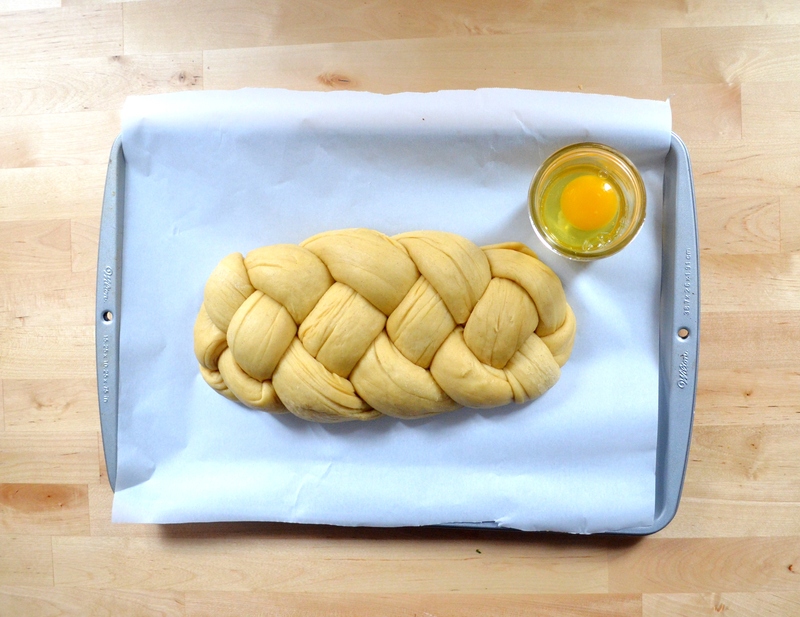 Brush the challah with the egg wash and let rise on top of the preheating oven for 30 minutes. Repeat the egg wash and place the challah in the oven. 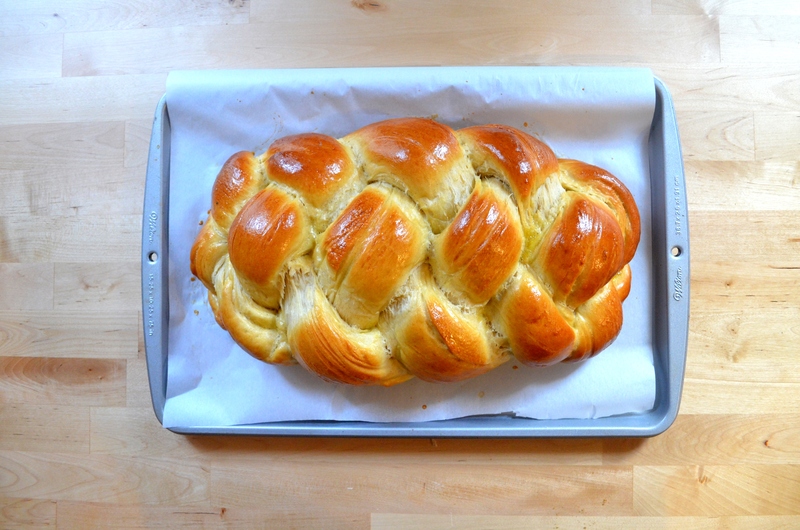 Bake for 40-50 minutes, until the challah is golden and beautiful. Life is wackypants right now. I just applied to residency programs, I’m trying to scramble-write my research manuscript, my sub-internship (in which I wear a long white coat and try not to kill people) is about to start, and HOLY CRAP GUYS IT’S PUMPKIN SEASON. Look at me. Look at this blog. This is a big deal. I think it’s necessary to explain that I take pumpkin season very seriously. 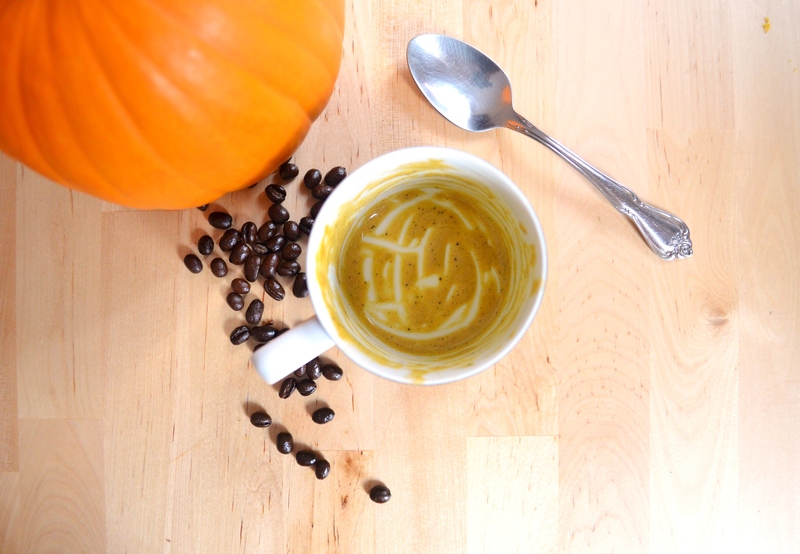 Like, try-to-transform-myself-into-a-winter-squash kind of serious. 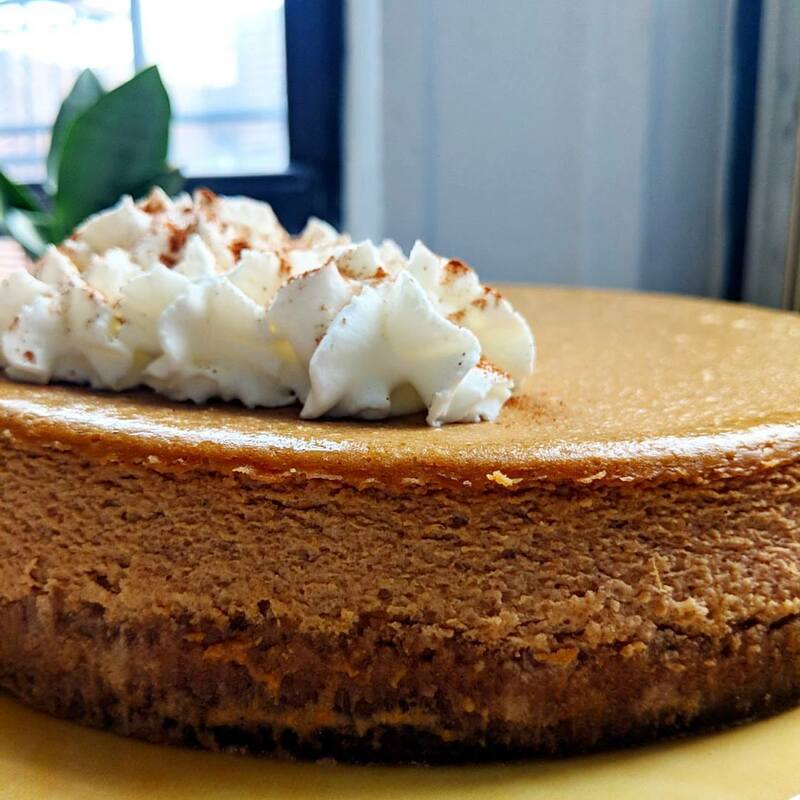 Last year, I cooked a brand-new pumpkin dish every single week for the entirety of pumpkin season, which, for all intents and purposes, extends from the beginning of September to the end of the year. This year, I’m continuing the tradition, with the added bonus of discovering a beer store down the road that has about 25 different (and changing) pumpkin beers in stock. 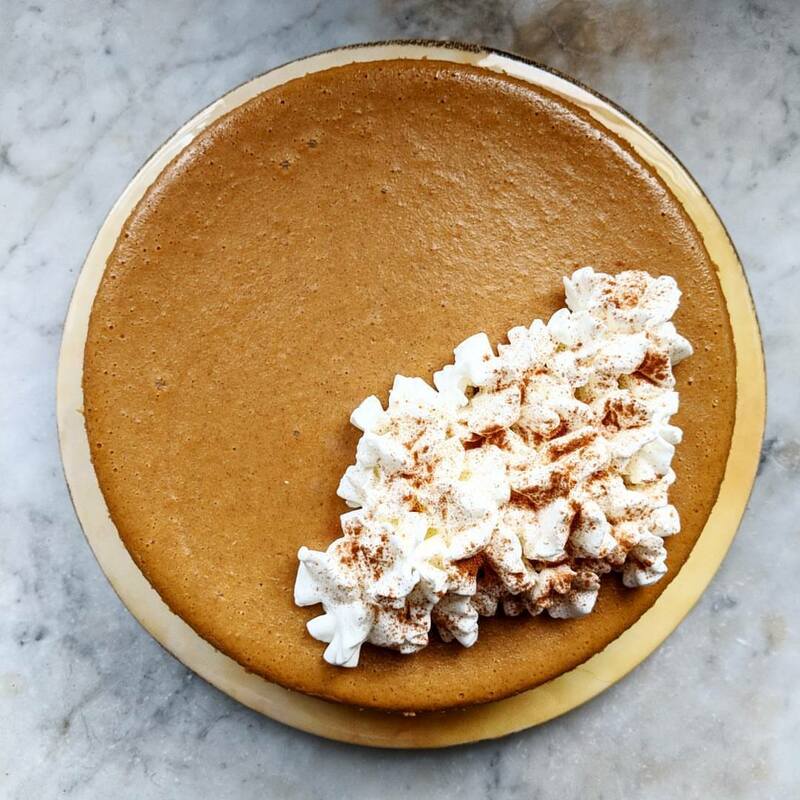 I also recently figured out that home-roasted pumpkin is both cheaper and more delicious than canned pumpkin and having a couple of the little darlings around all the time doubles as home decor! My point is this: posers spending $25 a week on Starbucks’ PSL ain’t got nothin’ on my pumpkin addiction. 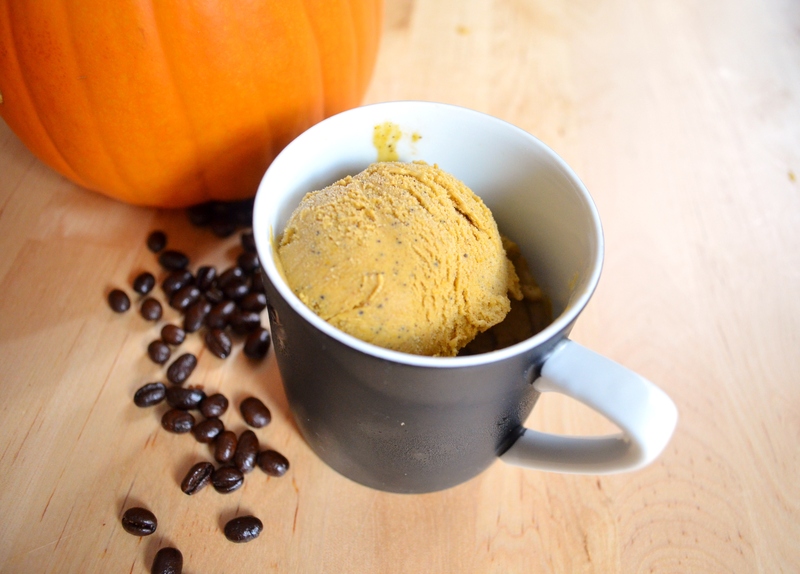 Which, at this moment, is manifesting itself in the form of PSL ice cream. Leave me a comment with suggestions for future pumpkin adventures! Fuel my crazyfire. 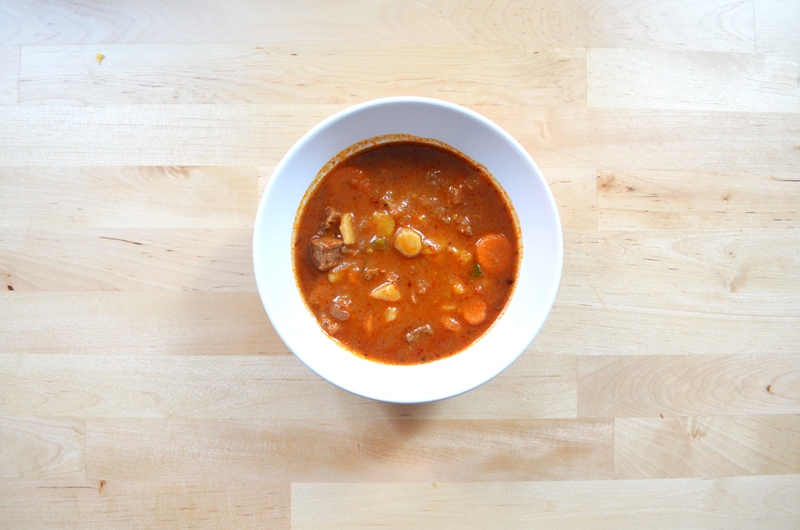 In a medium-sized pot, combine everything except egg yolks and pumpkin. Simmer over medium-low heat until the mixture is warm/hot (think nice relaxing bath temperature. if you were to bathe in spiced coffee cream. I won’t judge.). In a separate bowl, whisk egg yolks together, then carefully whisk in about a cup of the hot cream. Do this in a slow, steady stream, whisking all the while, because no one likes scrambled eggs in their ice cream. Add the egg mixture back into the pot and cook, stirring constantly, for about 5 minutes. The mixture should thicken to be able to coat the back of a spoon. Remove from heat and let the custard steep for 30 minutes at room temperature. Strain the custard through a fine mesh sieve, then mix in the pumpkin. Cover and chill in the fridge for at least 4 hours. Churn it in your ice cream maker! I kept mine going for about 30 minutes, but I think my KitchenAid attachment is defective so just follow the directions for yours. Transfer the ice cream to a container and store in the freezer for a couple hours before serving. Try to grind your coffee as coarsely as you can stand. I didn’t do a very good job of it and there were fine grounds in my ice cream. I didn’t care, but you might. My egg yolks were tiny, for whatever reason. If you’re using big eggs, maybe stick to 5. ROAST YOUR PUMPKIN. Oh man. It is so much better. Take a 2-3 lb sugar pumpkin, pop the stem off, slice it down the middle and scoop the guts out. 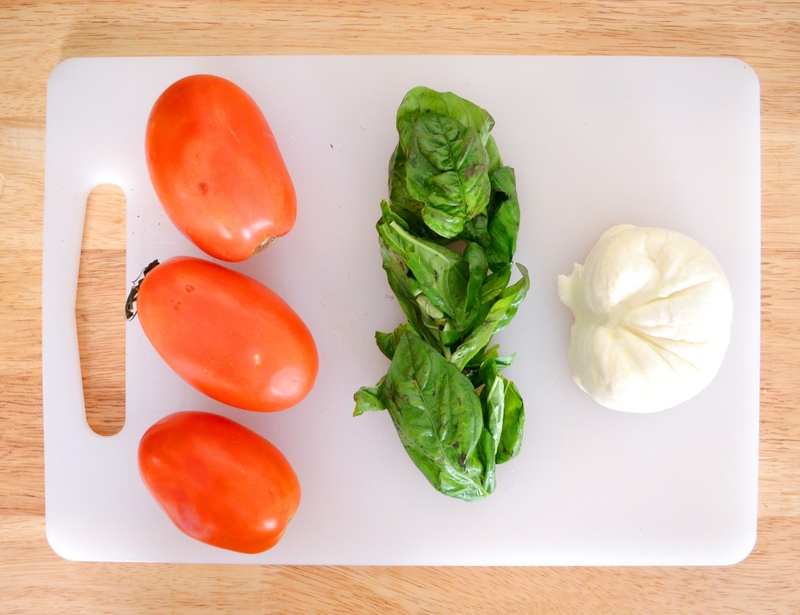 Brush it down with some coconut oil and place cut-side down on a baking sheet. Roast at 350°F for about 45 minutes, or until easily pierced by a fork. Scoop the flesh out and puree in a blender/food processor. This makes about the equivalent of a 15 oz can. Put the extra in your morning coffee!! I tend to like my foods inside of other foods. Fruit salad in a watermelon, soup in a bread bowl, cocktails in a coconut, chocolate mousse in an adorable tiny chocolate cup with accompanying chocolate saucer and spoonlet. Maybe that’s why I’ll always choose pie over cake. I love being able to open up my food and find a delicious surprise inside! This flavor combination was inspired by my neighborhood donut shop, Dough Loco, which likes to put weird things on top of their awesome yeasty donuts. Go there. 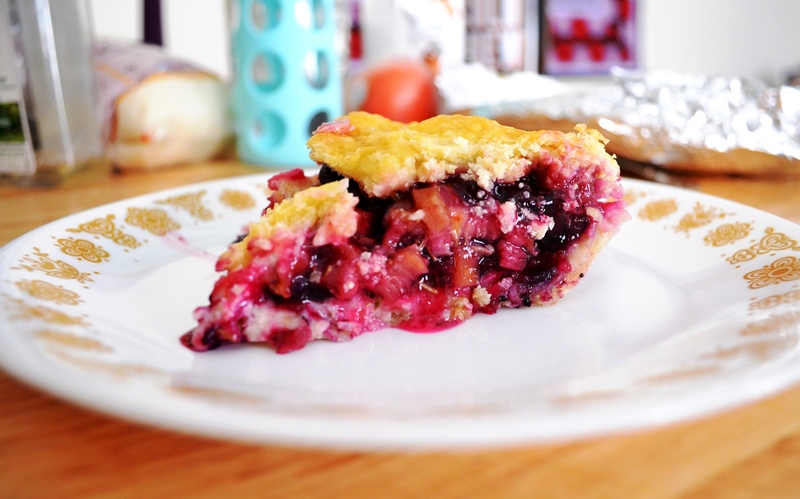 But first maybe make this pie. In a large bowl, combine flour with sugar and salt. Cut butter into flour using a pastry blender until butter is the size of small peas. Add water to mixture by the tablespoon and toss together with a fork, until dough comes together. Gather into two separate balls, flatten into disks, and wrap with plastic wrap. Store in refrigerator while preparing filling. Preheat oven to 400°F. Cut the rhubarb into 1/2-inch pieces and add to a large bowl with blueberries. Toss with sugar, tapioca, lime zest, and rosemary. 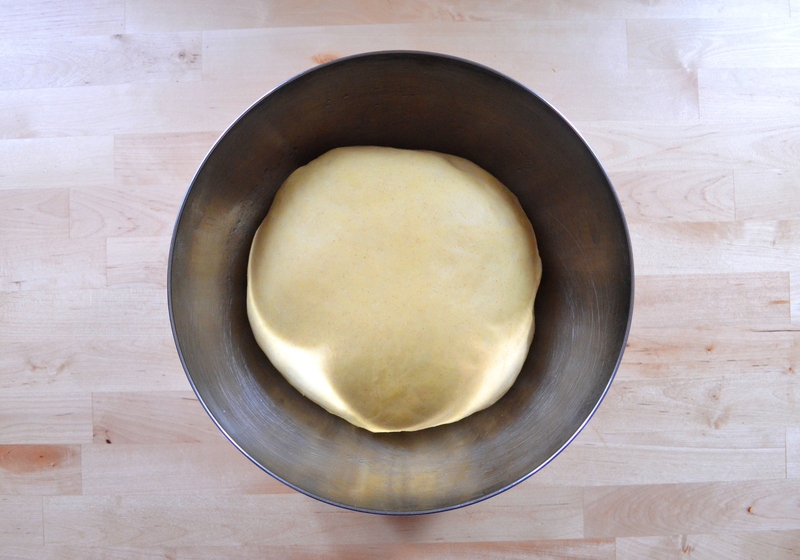 Roll out one disk of pie dough into a round large enough to drape over the sides of a 9-inch pie dish with a 1/2-inch overhang. I prefer to do this between two sheets of parchment, for less mess and easy transfer to the pie dish. Fill the pie with the fruit mixture after giving it another toss to distribute the juices. 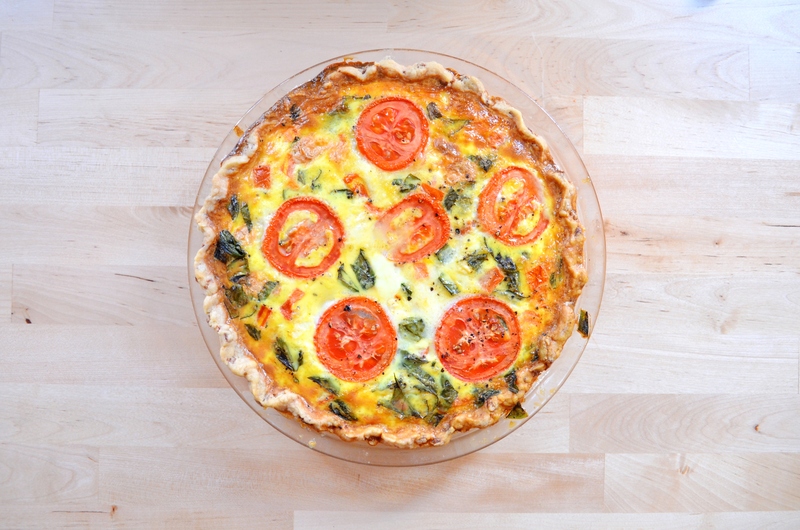 Roll out the other disk of dough and lay it over the top of the pie. Crimp the edges together and cut vents into the top crust. Brush the pie with the beaten egg and sprinkle some sugar on top. 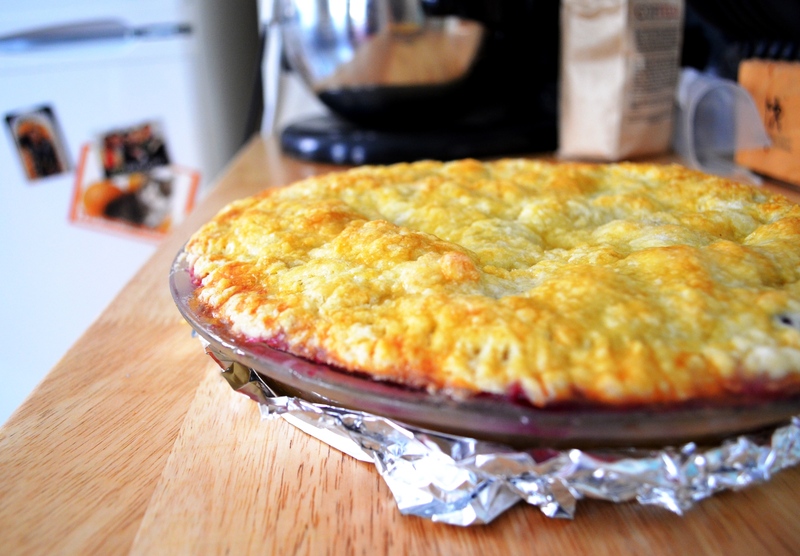 Place the pie on a foil-lined baking sheet in the middle of the oven. Bake for 15 minutes, then lower temperature to 350°F and bake for another hour. Remove from oven and let cool completely before serving.